Horse Sport Ireland have announced the combinations that have been selected to travel to the FEI WBFSH World Breeding Eventing Championships for Young Horses 2018. The Championships take place at Le Lion d’Angers, France from October 18th to 21st 2018. The horses and riders that have been selected to represent Ireland are listed below. Reserves are also detailed, alongside full breeding details. • OBOS Take One (ISH) – 2012 brown gelding by O.B.O.S. Quality 004 (OLD) and out of OBOS Nancy Broone (ISH). Bred by: Marie O Brien Co Cork. Owners: Suzanne Hagan and Linsday Klimacka. Rider: Suzanne Hagan (IRL). • Jewelent (ISH) – 2012 grey gelding by Valent (KWPN) and out of Bellaney Jewel (TB) (IRE), by Roselier (TB) (FR). Bred by: J.W Rosbotham Co Armagh. Owner: Lisa Rosbotham. Rider: Clare Abbott (IRE). • Homme D’Hotot M (KWPN) – 2012 brown gelding by Canabis Z (HOLST) and out of Hotot D (NPRS), by Animo’s Hallo (KWPN). Owner/Rider: Aoife Clark (IRL). • DSL The Entertainer (ISH) – 2011 bay gelding by Omar (BWP) out of Cloverhill Girl (ISH), by Clover Hill (ID). Owner/Bred by Caroline Bjoerk, Co. Kildare. Rider: Elizabeth Power (IRL). • OLS King Aragon (ISH) – 2011 bay gelding by Samgemjee (ISH) and out of Just Beauty Queen (ISH), by Seamanship (TB). Bred and Owned by Kieran Connors. Rider: Cathal Daniels (IRL). • Global Mentor (ISH) – 2011 bay gelding by Mermus R (KWPN) and out of Flora De Ribon (SF), by Tams Du Plessis (SF). Bred by Justin Burke Co Offaly. Owner: Marie Symington. Rider: Brian Morrison (IRL). • Briarhill Marco (ISH) – 2011 bay gelding by Mermus R (KWPN) and out of Stricker Rua (ISH), by Maltstriker (KWPN). Bred by Kathleen Coyne Co Galway. Owners: Tom & Carol Henry. Rider: Michael Ryan (IRL). • Celus D’Ermac Z (ZANG) – 2011 brown gelding by Chico’s Boy (HOLST) and out of Valencia Odeveld (HOLST), by Corofino I (HOLST). Owner/Rider: Aoife Clark (IRL). • Galant DHI (KWPN) – 2011 bay gelding by Indoctro (HOLST) and out of Urona (KWPN), by Hold Up Premier (SF). Owners: Heidi & Ian Woodhead. Rider Cathal Daniels (IRL). • Barnahown Corn Hill (ISH) – 2011 brown gelding by Chinhook Eclipse (TB) (USA) and out of Mats Lady (UNK). Bred by Michael Lynch Co Cork. Owners: Tom & Carol Henry. Rider: Michael Ryan (IRL). • Keonan Hero (ISH) – 2011 chestnut gelding by Calgot Hero (UNK) and out of Miss Siss (ISH), by John Henry (ISH). Bred by: Lisa Rosbotham Co Armagh. Owner: Marina O Hare. Rider: Declan Cullen (IRL). • Lukas (ISH) – 2011 bay gelding by Lux Z (HANN) and out of Say Wonderful (TB) (IRE), by Roi Danzig (TB) (USA). 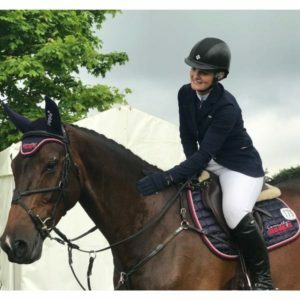 Bred and owned by Louise Parkill: Rider Camilla Speirs (IRL). • Regal Bounty (ISH) – 2011 black gelding by Orestus (KWPN) and out of Edge of Reason (ISH), by Senang Hati (TB). Bred by: Miriam De Feu. Owner: James O Callaghan. Rider: Felicity Ward (IRL). The Selection Committee members are Janet Murray (Chef d’Equipe), Lt Col. Tom Freyne and Rodney Powell. The Advisory Committee includes the three selectors, Barbara Hatton (ISH Representative) and Mandy Driesch (WSI Representative).